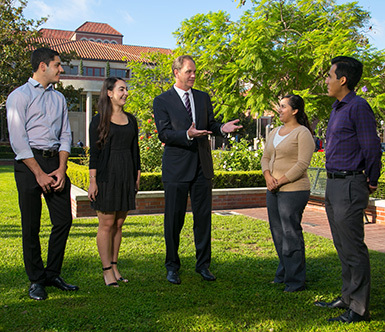 USC Price School of Public Policy Dean Jack H. Knott speaks with students outside Lewis Hall. Defining characteristics of USC Price are the depth of its academic classroom experience and connecting classroom theory to professional practice through practicums, internships and laboratory work locally, nationally and around the globe. Students can also participate in international exchange programs and acquire knowledge and skills necessary to become successful leaders in a global market. Students graduate with the knowledge, skills and experiences to lead in their chosen field of practice. The Price School International Exchange Programs are one-semester exchange programs with a host institution in Germany or South Korea during either the fall or spring semester. These programs provide opportunities for students to acquire knowledge and skills necessary to become successful leaders in a global market. Students complete a maximum of 12 units at the host institution. All instruction is in English; proficiency in a foreign language is not required. Courses completed are graded credit/no credit on the student's USC transcript. The courses are selected from a list approved by the Price School of Public Policy. Students must work with their program administrator to understand how the courses will return to their degree. This program is designed to prepare competent individuals to administer the long term care needs of America's elderly population. It is jointly offered by the USC Leonard Davis School of Gerontology, the Marshall School of Business, and the Price School of Public Policy. For information see the USC Leonard Davis School of Gerontology . Acceptance to graduate standing does not in itself imply that the student is admitted or will be admitted to candidacy for an advanced degree. Application for admission as a candidate for an advanced degree is a separate and subsequent step. See the The Graduate School section of this catalogue.